1984: Master degree (RNDr.) in geophysics at the Faculty of Mathematics and Physics, Charles University, Prague. Master thesis: Reconstructing the records of historical earthquakes with macroseismic effects in Prague (supervisor J. Zahradník). 1991: Ph.D. degree (CSc.) at the same institution. PhD thesis: Three-dimensional modelling of mantle convection (supervisor K. Pěč). 1997: Associate Professor (Doc.) at the same institution. 2015: Professor of Geophysics at the same institution. 1979-1984: Study of geophysics at the Faculty of Mathematics and Physics, Charles University, Prague, Czechoslovakia. 1985-1990: PhD study at the Department of Geophysics, Faculty of Mathematics and Physics, Charles University. 1991-1992: Postdoctoral stay in the Geodynamical Laboratory of the Ecole Normale Superieure in Paris (12 month). 1992-1995: Research associate at the Department of Geophysics, Faculty of Mathematics and Physics, Charles University. 1995-1997: Assistent professor at the same department. 1997: Visiting researcher at the Faculty of Earth Sciences in Utrecht, The Netherlands (3 months). 1997-1999: Visiting professor at the Ecole Normale Superieure in Paris (12 months). 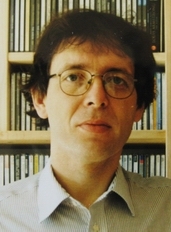 1997-2015: Associate professor at the Department of Geophysics, Faculty of Mathematics and Physics, Charles University. 2002: Visiting professor at the Ecole Normale Superieure in Paris (1 month). 2004: "Gauss Professor" for the year of 2004 at the University of Gottingen, Germany (3 months). 2005: Visiting professor at the University of Nantes, France (1 month). 2007: Visiting professor at the University of Nantes, France (1 month). Since July 2014: Head of the Department of Geophysics, Faculty of Mathematics and Physics, Charles University, Prague. Continuum mechanics (undergraduate course for students of general physics). Gravity field and the figure of the Earth (undergraduate course for students of geophysics). Introduction to planetary science (undergraduate course for students of general physics). Mathematical methods in geophysics (course for PhD students with geological background). Hana Čížková: Modeling the dynamical processes in the Earth mantle (defended 1996). Jan Matas: Modelisation thermochimique des proprietes de solides a hautes temperatures et hautes pressions (en cotutelle with Y. Ricard, ENS Lyon, France, 1999). Ladislav Hanyk: Viscoelastic response of the Earth: Initial-value approach (1999). Ondřej Šrámek: Modele d'ecoulement biphase en sciences de la Terre: fusion partielle, compaction et differenciation (en cotutelle with Y. Ricard, ENS Lyon, France, 2007). Martin Pauer: Forward and inverse modeling of planetary topographies and gravitational fields (2013). Petra Maierová: Evolution of the Bohemian Massif: Insights from numerical modeling (2013). Matthieu Thomas Quinquis: Numerical models of slab dehydration (supervised with S. Buiter, Geological Survey of Norway, Trondheim), defended 2014. Klára Kalousová: Dynamics of icy satellites with a liquid phase (supervised with G. Choblet, University of Nantes, France), defended 2015. Vojtěch Patočka: Visco-elasto-plastic deformation of outer shells of planetary bodies, defence expected 2017. Pavel Hrdina: Modeling of the stress field in the lithosphere (defended 1991). Barbara Bystrzycká: Modeling the viscosity and density structure in the Venus mantle (1994). Hana Kývalová: Phase transitions and the dynamics of the Earth's mantle (1994). Jan Matas: Mantle viscosity and density structure (1995). Martin Klika: Modeling the flow in a mantle with laterally dependent rheology (1995). Alice Slancová: Analysis of Mesozoic and Cenozoic plate motions and their relation to mantle convection (1995). Stanislav Med: Modeling mantle convection in a mantle with impermeable interface at a depth of 660 km (1999). David Rožek: Prediction of the geoid at intermediate wavelength (2000). Ondřej Šrámek: Dynamic geoid modeling (2001). Martin Pauer: Dynamic analysis of gravity field and topography of Venus (2004). Petra Maierová: Estimating the rheology parameters of icy satellites from observed surface deformations (2008). Klára Kalousová: Internal dynamics of Mars: constraints from geoid and topography (2010). Miroslav Kuchta: Thermal convection with evolving surface in a rotating icy satellite (2011). Vojtěch Patočka: Polar wander prediction based on the solution of the Liouville equation (2013). Kateřina Sládková: Viskoelastic deformation in geophysical applications (2014). Petra Maierova: Effects of tidal heating on processes in icy satellites (defended 2006). Jana Lazorcakova: Sea-level changes for various scenaria of global warming (2007). Klara Kalousova: Solar system bodies: internal structure analysis based on topography and gravity data (2008). Sona Formankova: Physics of terrestrial bodies - a textbook (2008). Miroslav Kuchta: Mantle flow modeling: application of a staggered grid method in a spherical geometry (2008). David Eispigel: Icy satellites of giant planets (2010). Vojtech Patocka: Polar wander due to thermal convection in a planetary mantle (2010). Marek Kozoň: Thermal evolution of Saturn's moon Enceladus (2015). Dominik Vach: Anelastic deformation of planetary bodies (2016). Jakub Šafin: Flow in a subsurface ocean in the shallow water approximation (2016). Martin Krivoš: Numerical modeling of liquid water flows in ice bodies' interiors (2016). Nela Dvořáková: Tidal heating of icy bodies in the Solar System (2016). Jakub Kvorka: Thermal-deformational evolution of Saturn's moon Enceladus (2017). 1997-1999: GAUK No. 7/1997: "Seismic anisotropy constraints on mantle convection models" (137000 CZK). 2002-4: GACR No. 205/02/1306 "Forward and inverse modelling in mantle with laterally dependent viscosity"
Yuen, D.A., Matyska, C., Čadek, O. and Kameyama, M., 2008: The dynamical influences from physical properties in the lower mantle and post-perovskite phase transition. In: Post-perovskite: the last mantle phase transition, ed. by Kei Hirose et al., Geophysical monograph 174, AGU 2008. Čadek, O., Yuen, D.A. and Čížková, H.: Mantle viscosity inferred from geoid and seismic tomography by genetic algorithms: Results for layered mantle flow. Phys. Chem. Earth, 23, 1998, 865-872. Yuen, D.A., Čadek, O., van Keken, P., Reuteler, D.M., Kývalová, H. and Schroeder, B.A. : Combined results from mineral physics, tomography and mantle convection ad their implications on global geodynamics, in: Seismic Modelling of Earth Structure, ed. E. Boschi et al., Editrice Compositori, Rome 1996. Čadek, O. and Matyska, C.: Variational approach to modeling present-time mantle convection. Stud. Geophys. Geod., 36, 1992, 215-229. Matyska, C. and Čadek, O.: Lateral variations of the mantle density and fluctuation of the core-mantle boundary -- Reply to Z.R.Ye. Phys. Earth Planet. Inter., 69, 1992, 216. Matyska, C. and Čadek, O.: Lateral variations of the mantle density and fluctuation of the core-mantle boundary -- Comment. Phys. Earth Planet. Inter., 69, 1992, 207-213. Čadek, O. and Matyska, C.: Mass heterogeneities and convection in the Earth's mantle inferred from gravity and core-mantle boundary irregularities. Pure Appl. Geophys., 135, 1991, 107-123. Čadek, O. and Matyska, C.: Three-dimensional modelling convection in the Earth's mantle: Influence of the core-mantle boundary. Stud. Geophys. Geod., 34, 1990, 278-283. Čadek, O.: Studying earthquake ground motion in Prague from Wiechert seismograph records. Gerlands Beitr. Geophysik, 96, 1987, 438-447 (PDF).